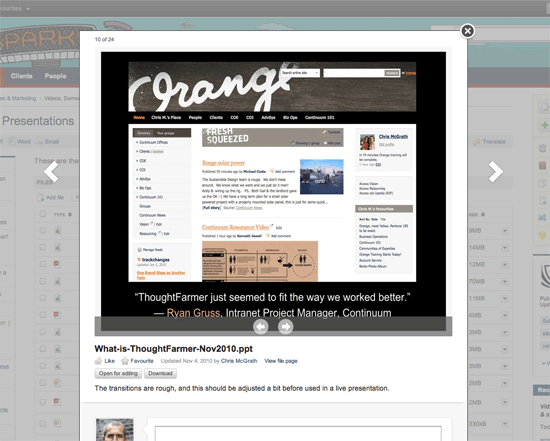 Version Notes: ThoughtFarmer 6.0 — Intranet Software. Simplified. ThoughtFarmer 6.0: The World’s Easiest Intranet Software. The changes in ThoughtFarmer 6.0 revolve around one goal: for ThoughtFarmer to be the most user-friendly intranet software in the world, so that you and your colleagues can truly work together better. To accomplish this, we overhauled our content creation interface, we overhauled our direct document editing interface, we overhauled our document management features, and we provided an easy way to archive old content. The overhauled content creation interface is easy on the eyes. Key controls are prominent and simple, while seldom-used options are subtle but still accessible. This new interface is intuitive for new users and really efficient for power users. Click the big Publish button when you’re ready to make it live. The refreshed page controls box showcases the most important options, while hiding infrequently used controls. Guided Tour for First Time Users: The first time a new user enters the add/ edit interface, a pop-up dialogue will display that describes the add / edit page workflow and shows how to access the less-used controls. Simple Page Type Selector: Immediately below the publish box is a new, prominent page type selector. Choose from the available page types: a regular page or a section, group, newsfeed, blog, forum, calendar, gallery or link. You can also go back and change the page type at any time. Improved Rich Text Editor: To achieve the best possible content creation experience, we rearranged the rich text buttons, so the groupings are more natural. Auto-recovery: Browser crash or network outage? ThoughtFarmer will auto-recover your unsaved updates and edits. Manage thousands of files within your intranet. With new features like document preview and document library and major improvements to direct document editing, we’ve made it easy to collaborate on documents using your ThoughtFarmer intranet. Create beautiful, easy-to-manage document libraries on any page or in any group. Instant Document Preview: Find the right file quickly with document preview. Preview Word, PDF, and Powerpoint documents before downloading them. Great for handling large files over slow connections. Document preview lets you browse the first few pages of each file, before you download it. Document Libraries: Turn any page or any group into a document repository. Upload, organize, and manage files simply and easily with the new Document Library view. Plus, all document content is fully searchable within your intranet search. Direct File Editing: The overhauled ThoughtFarmer Desktop Connector makes it easy to open and edit intranet files on your desktop. Quickly access files you are currently working on from the top app bar. Version History & Commenting: Comments made on file pages now show the version they are referring to, making sure all team members are on the same page when group editing. Drag and Drop File Uploading: Drag a file from anywhere on your computer onto your intranet. The file will instantly upload to that page. The key to a successful intranet is fresh, relevant content. How do you keep the most important files and pages front and center, while maintaining a detailed history of all your past work? The answer is instant archiving. Archive a Page / Section: Users can one-click archive from page settings. For sections (pages that have sub-pages), sub-pages will also be archived. Once the page is archived, the page settings show a”Restore” option to un-archive the page. 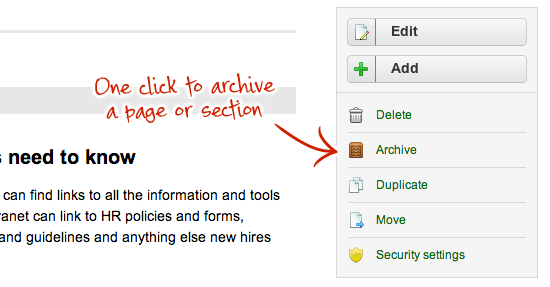 Use the archive button to archive a page or a section in one click. Future Date Archiving: For content with a known expiry date (for example, a promotion or an event), page owners have the option to set a future archive date. Archiving will take place automatically on that date. Hide or Show Archived Content: Need to find something you archived? Users can choose to show or hide archived content from their app bar. Archived content is tagged and colour coded, so it can be easily differentiated from new content. Hide or Show Archived Search Results: To make sure you can always find what you’re searching for, the search results page displays a link with the number of archived search results that matched your query. Clink the link to view the archived search matches. Stale Content Report: Administrators can quickly prune old, unused content with the stale content report. Search and archive content based on how frequently it’s used. 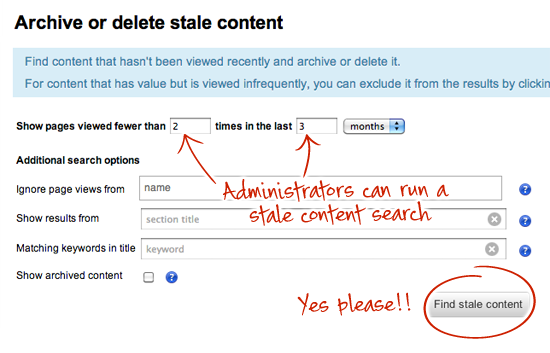 Quickly pare down intranet content with the stale content search. It may sound simple, but the ability to duplicate a page can be a huge time saver. One-click duplication lets you quickly copy meeting agendas, project templates, and frequently used documents. One-click duplicate is ideal for templates you use regularly, like meeting agendas. The new content publishing and content subscription interface makes it easy to push and pull news feeds across your intranet. Easily add blogs, forums, and external news feeds to any page or side bar. 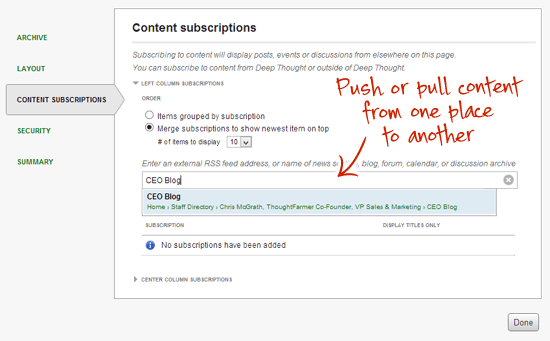 Use the content subscription settings to add news, blogs, forums, and external RSS feeds to your page. One of the major benefits of a social intranet is that you can always see who owns a piece of content. However, this can cause problems when people change jobs or leave the company. New administrative options allow intranet managers to quickly reassign sections of content from one owner to another. Custom portlets let you use simple, isolated coding to customize sections of your intranet. With the new import/export tool, you can now download and share custom portlets from our database and with other ThoughtFarmer clients (administrators should see the support site for details). 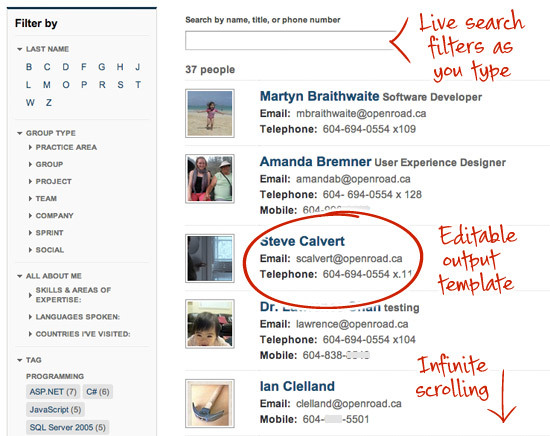 The Employee directory is now even faster and easier, with infinite scrolling and live search.